Do You Have Any Stats or Reports on Our Donut Pairings? 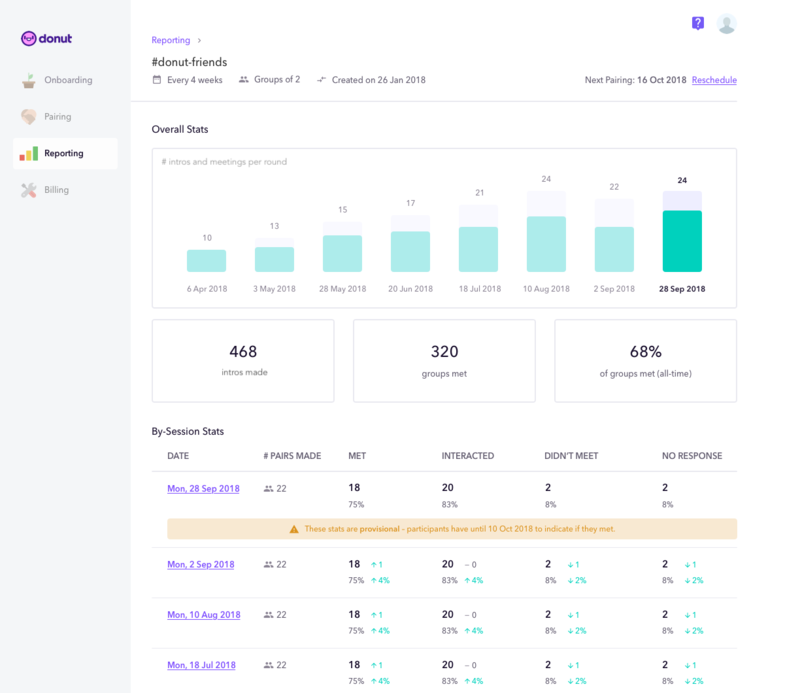 Here are the insights and metrics that are available to your team. Sometimes teams that use Donut want some insights on pairings and meetings that are taking place. 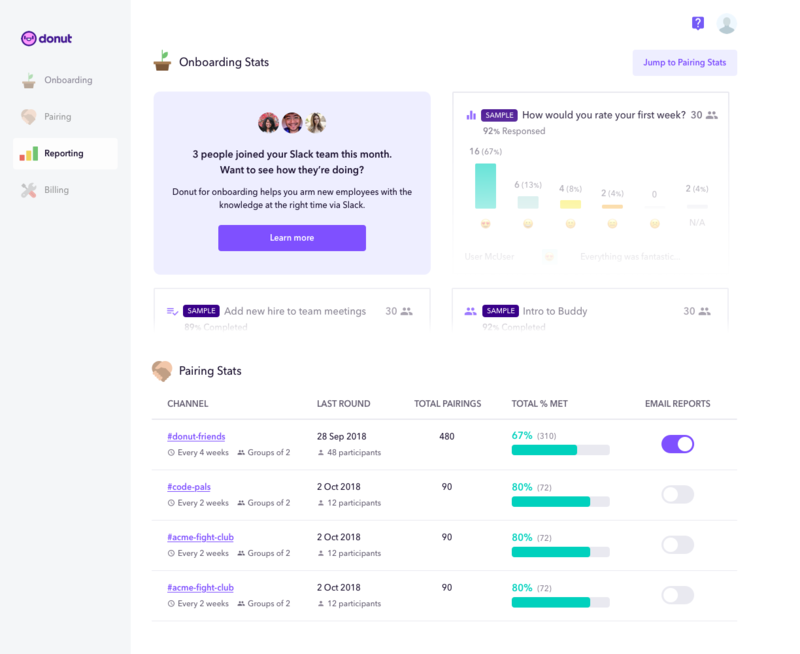 There are a few different ways you can get more information on your pairing stats: in an email report, from the dashboard, or in your pairing channel on Slack. Note: at the moment we don't include names of pairs made in any of our reports due to privacy concerns. How Do I Set Up Email Reporting? 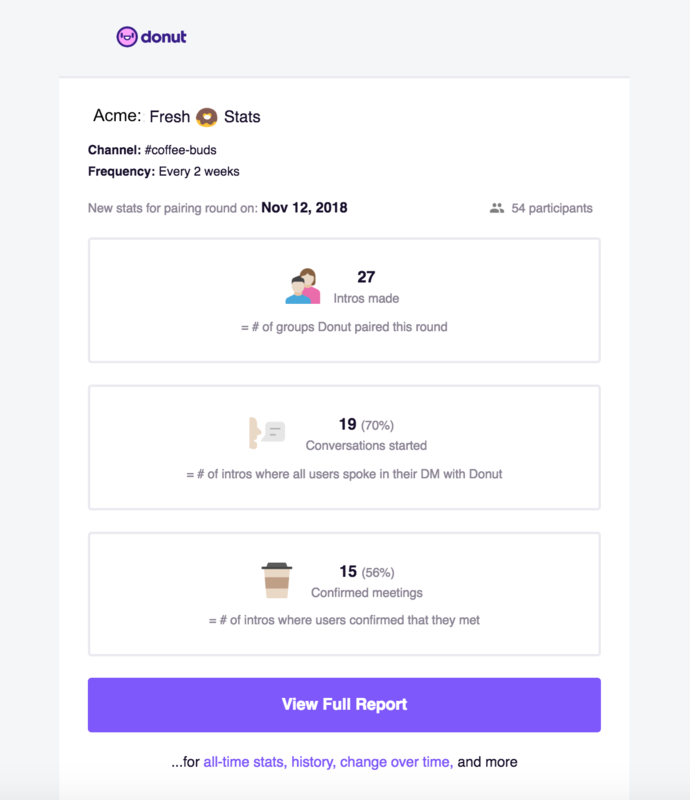 If you'd like to receive the report, just sign into your account at donut.ai using your Slack credentials for your Workspace, and select the channel for which you'd like to receive reports. Navigate to the "Advanced" tab and scroll to the bottom. Under "Just For You," you'll see a switch for the email report. Don't forget to hit "Save!" You can see when your next report is scheduled to send by going to the "Advanced" tab and scrolling down. In the left navigation, click "reporting"
Pro tip: you can quickly jump down to your pairing stats by clicking the "Jump to Pairing Stats" button in the top right corner. To view more details about a particular channel, you can click on the channel name on the left side. The channel-specific stats page allows you to view all-time stats, channel history, and change over time. It shows how many groups met, interacted, or were unresponsive week over week, so that you can track your status over a period time. This is a great way to get a quick read on your team's engagement with Donut. You can also have Donut post some very basic stats in your pairing channel after each pairing round. This is a great way to keep the team excited and engaged with pairings. How Do I Set Up Stats In Channel? At the top of the "Advanced" tab, you'll see an option for posting stats in channel. Toggle this on to begin receiving an update in your pairing channel from Donut after each round of pairings.